When Drex prevents Young Ray from ever being densitized in the past, Henry and a now-destructible Ray must take on Drex and help Ray get back his indestructibility. 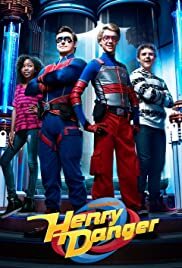 When Drex escapes into the Time Jerker's time portal, Henry and Ray must go back into the past and stop him before he permanently alters Ray's past. When Charlotte has a dream where she nearly kisses Kid Danger, she actively tries to avoid Henry for fear of the dream coming true. Stars: Cree Cicchino, Madisyn Shipman, Benjamin Flores Jr.
Come on guys, give the show a chance. I know the plot is blurring with the acting off a little but, everyone van admit that it is fun to watch. When one is worked up or bored, this show provides the fun to keep you smiling. Maybe everyone not caring for Jasper is bad but haven't we seen good films with that same situation? I do admit that I don't see any essence in the role of Jasper the movie because even though he is the best friend of Henry and Charlotte, the film barely makes you notice it. The only thing I mostly hated about this movie was the fact that the way Piper disrespects her parents is like, teaching kids what they shouldn't do. Her rivalry with Henry is OK, but how she talks back at her parents, orders them around and his her parents fail to even discipline her. Well aside that, the movie us great. The episodes are fun and maybe we should give it a chance, maybe as it progresses further, it would be better.